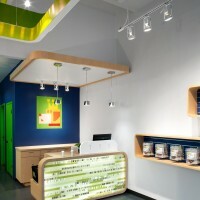 MCM Interiors have designed My Fluffy Friend’s Pet Shop in Vancouver, Canada. With a limited budget, MCM Interiors was able to change this 950 square foot space which used to be a very dark lounge, into a bright, fresh, and playful environment which was both pet and people friendly. 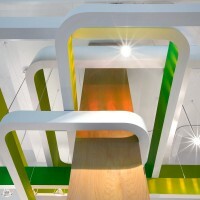 The large structural column in the middle of the front retail display space presented both a problem and opportunity. 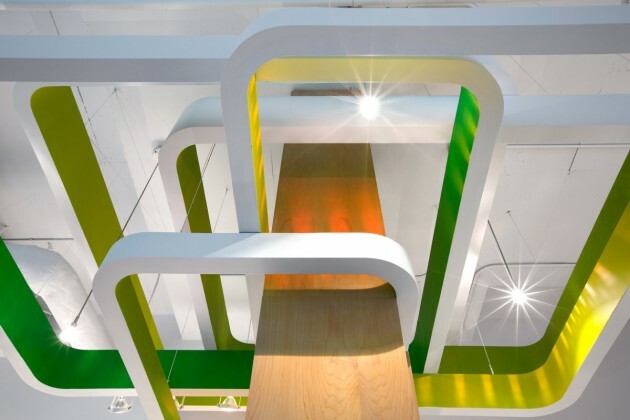 Starting with an outdoors theme, the column was transformed into an abstract tree form, with painted MDF rings suspended from the ceiling. Various millwork around the base provides display opportunity. 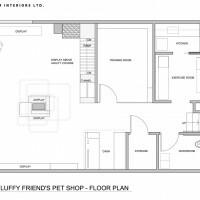 The clients wanted an interactive space for both dogs and dog owners. Plenty of clear space was left for the pets to roam free, so display was delegated to the walls. Curved, colorful, contemporary shelves line the perimeter walls. A mini agility course was created below for the dogs to experience different textures and surfaces, using fake grass, pebbles, a ramp, and tunnel. 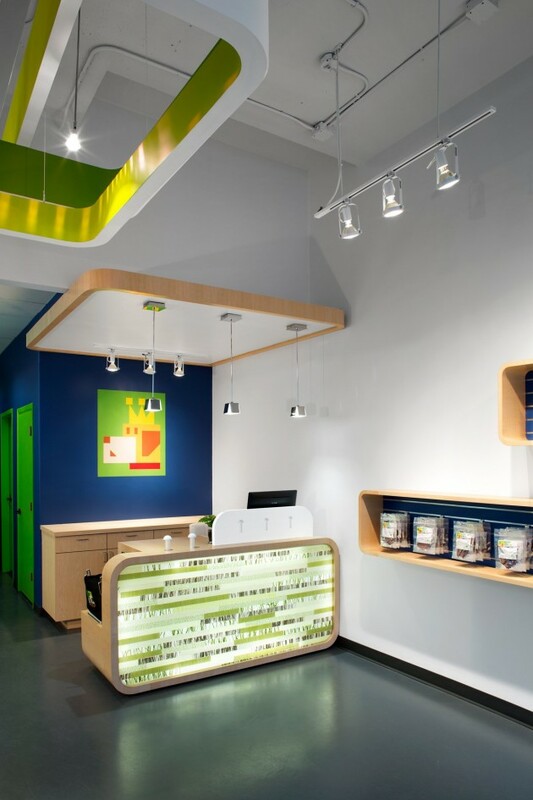 The cash desk area proudly displays the company logo on the back wall, and a glowing green grass inspired back lit front panel provides light and interest. Little mushroom shaped pegs on the desk top allow owners to temporarily leash their dog while they complete their transaction. One of the company’s feature products, made in house, is all natural jerky of various types. They are displayed on the entry wall leading to the cash desk. Additional renovations included a training room area with fun cartoon like tree shaped wall tattoos, as well as an exercise room with doggie treadmills available to rent in the back.